Rules discriminating against Christian and Muslims were adopted on 10 August 1950. The Bishops' Conference called on all Catholics to take part in demonstrations, candle vigils and hunger strikes to protest. For Card Gracias, the Christian community “does not require special favours; it wants justice and equality". 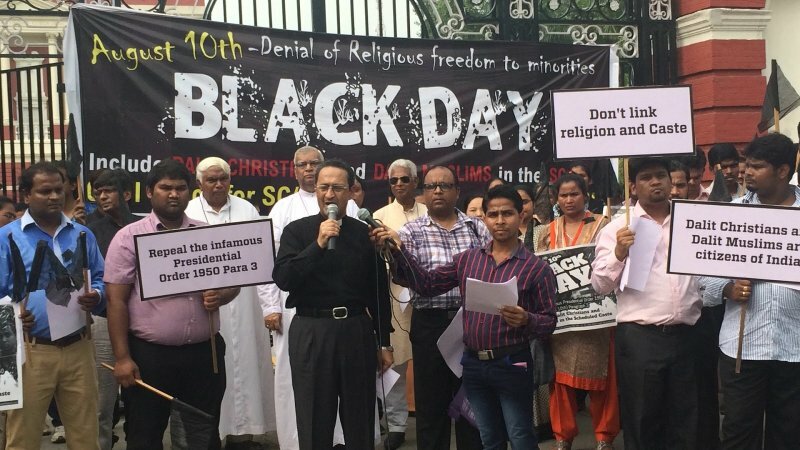 New Delhi (AsiaNews) – The Christian community "does not require any special favours; it wants justice, equality and minority protection, guaranteed by the Constitution of the country. Like other Dalits, Christian Dalits face discrimination, and are not protected from violence since they do not fall within the official category of Scheduled Castes,” said Card Oswald Gracias, president of the Catholic Bishops' Conference of India (CCBI), on the occasion of ‘Black Day’, a day of protests held every year on 10 August to highlight the discrimination against Christian Dalits. On 10 August, 1950, the President of India, under Article 341 (1) of the Indian Constitution, signed 'Constitution Scheduled Caste Order 1950’. However, the decree, under paragraph 3, says “no person who professes a religion different from the Hindu religion shall be deemed to be a member of a Scheduled Caste”. Amendments were made in 1956 and 1990 to cover Buddhists and Sikhs, but Christians and Muslims were left out. Because of this law, Hindu Dalits have economic, educational and social advantages with job quotas assigned in the bureaucracy. For a long time, Dalit Christians and Muslims have deemed the Order as illegal, and a violation of the constitutional principles of equality (Article 14), no religious discrimination (Article 15) and freedom to choose their own religion (Article 25). Dalits represent about two thirds of India’s Christian community, who make up 2.3 per cent of the country’s population. For the 66th anniversary of the Order, the CCBI called on Catholics to observe a "black day in your respective dioceses and institutions. Organise meetings, demonstrations, hunger strikes and candle vigils to show solidarity with Christians who suffer. Please make use of the media, especially social media, to spread the news to civil society." “The Church has been hurt recently, as evinced by the attack against a Dalit bishop. At the same time another Dalit was consecrated bishop."